The kids are back in school and the weather is slowly changing. It’s time for another “What to Wear Wednesday”. The color brown is the new neutral of the season. Don’t worry, black is not going anywhere. But, it’s been awhile since we have seen brown on our feet as a fashion color so, we thought we would show you some examples of how we would wear this versatile shade. Faux fur in every style and color is the coat of the season. We would wear this “teddy bear” coat with these two-tone ankle boots from Ernesto Dolani. They’re borrowed from the boys, yet slightly feminine with its chunky heel. If you haven’t already noticed. Plaid everything is also the trend when it comes to prints. 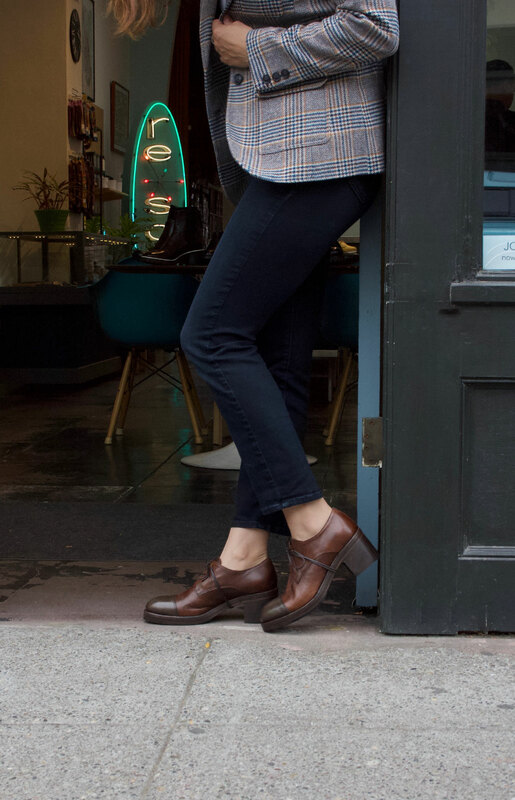 Besides wearing these oxfords with pants, we would gladly wear them with tights and a dress. Moma’s wingtip design and rich coffee color make them the perfect match for an outfit like this. We are diggin all the spicy tone colors in ready to wear for this season. We love pumpkin, rust, mustard, ochre and olive greens. Best neutral to go with? Brown of course! We would wear these dark chocolate beauties from Ernesto Dolani with everything!